Total time: 3 hours + 24 hours for Char Sui. 1. Heat the vegetable oil in a wok or pan. Sauté the shallots for one or two minutes until soft. 2. Add diced char sui to the wok/pan and stir. 3. Add oyster sauce, dark soy sauce and sesame oil to the pork mixture, stir fry for one minute. 4. Mix cornflour and stock together and then add to the pork mixture. 6. Remove mixture from wok/pan and place in a bowl to cool. Set aside until ready to use. 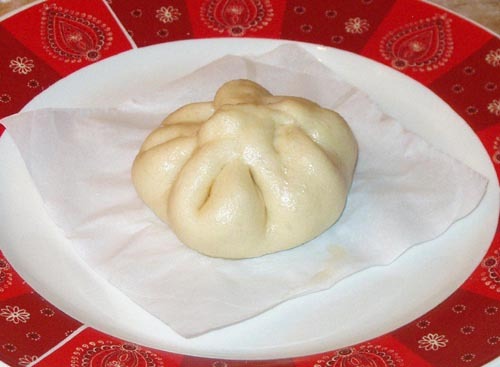 I tried a variety of doughs for the steamed buns, and the listed recipe gave the best first night results. If overcooked, it didn’t hold up very well, though. So don’t overcook! These froze and steamed (plus five minutes) very well. Kathlyn of Bake Like a Ninja was our Daring Cooks’ March 2011 hostess. Kathlyn challenged us to make two classic Peruvian dishes: Ceviche de Pescado from “Peruvian Cooking – Basic Recipes” by Annik Franco Barreau. And Papas Rellenas (de carne) adapted from a home recipe by Kathlyn’s Spanish teacher, Mayra. Total time: About 3 hours. 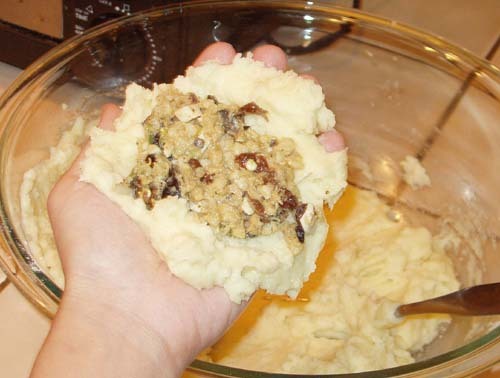 In order to save time, you can boil the potatoes, and while they are cooling, you can make the filling. While that is cooling, you can make the potato “dough.” In this way, little time is spent waiting for anything to cool. 1. Boil the potatoes until they pierce easily with a fork. Remove them from the water and cool. 2. Once the potatoes have cooled, peel them and mash them with a potato masher or force them through a potato ricer (preferred). 3. Add egg, salt and pepper and knead “dough” thoroughly to ensure that ingredients are well combined and uniformly distributed. 1. Gently brown onion and garlic in oil (about 5 minutes). 2. Add the chili pepper and sauté for a couple more minutes. 3. Add ground beef and brown. 4. Add raisins, cumin and paprika and cook briefly (a few seconds). 5. Deglaze the pan with white wine. 6. Add olives and cook for a few moments longer. 7. Add hard boiled eggs and fold in off heat. 2. 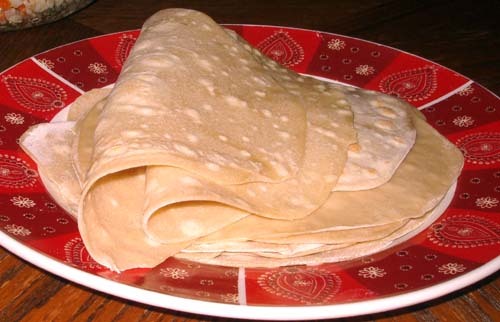 Flour your hands and scoop up 1/6 of the total dough to make a round pancake with your hands. 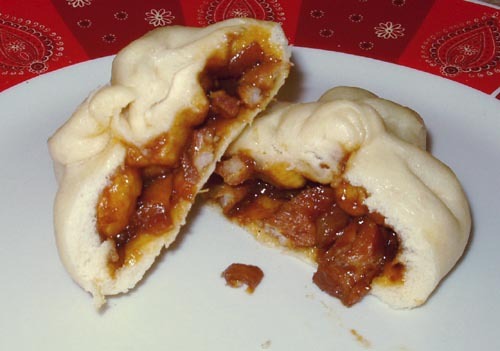 Make a slight indentation in the middle for the filling. 3. 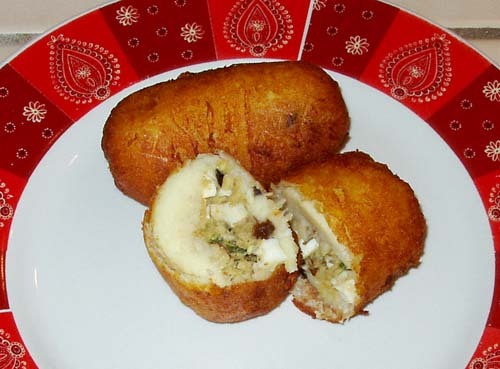 Spoon a generous amount of filling into the center and then roll the potato closed, forming a smooth, potato-shaped casing around the filling. Repeat with all dough (you should have about 6 papas). 4. Heat 1 ½ – 2 inches (4 – 5 cm) of oil in a pan to about 350 – 375° F (175 – 190°C). 5. Dip each papa in the three bowls to coat: first roll in flour, then dip in egg, then roll in bread crumbs. 6. Fry the papas (in batches if necessary) about 2-3 minutes until golden brown. Flip once in the middle of frying to brown both sides. 7. Drain on paper towel and store in a 200ºF (95ºC) (gas mark ¼) oven if frying in batches. 8. 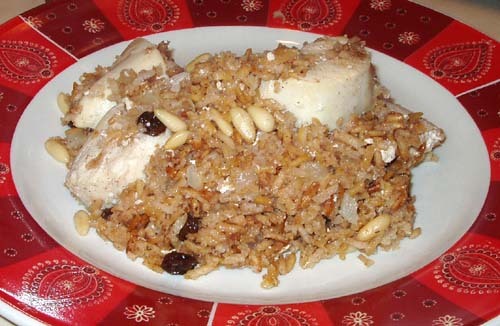 Serve with salsa criolla (or other sauce of preference) immediately. I was too chicken to try the ceviche (I’m not ready yet! ), so I thought I’d combine the challenge and make potatoes stuffed with fish instead of ground beef. This was incredibly tasty, and they cook fast in the deep fryer. It definitely needs the salsa criolla or some other tangy sauce if you do fish. Sour cream and hot sauce just didn’t cut it. I put a pair of jalapenos in there, too, but I didn’t even remotely feel them because of all the potato. 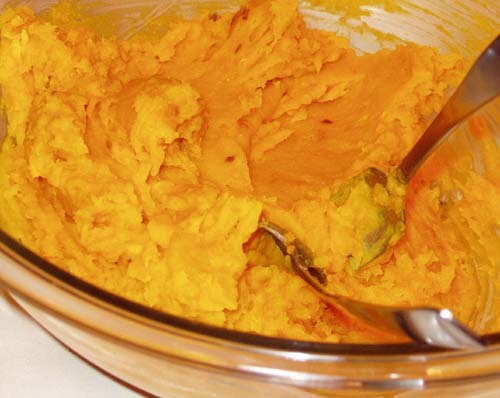 The filling needs to be a little saltier and spicier than you want it before you surround it in potatoes to fry. 1. In a large enough pot to avoid overcrowding, cover the eggs with cold water. Bring to a boil over medium heat and simmer for twelve minutes. 2. Remove the eggs with a slotted spoon and keep the cooking water. done by tapping and rolling the eggs very gently on the counter. 5. Heat gently and simmer, covered, for one hour. 6. Remove the pan from the heat and let the eggs cool down in the liquid for 30 minutes. 7. 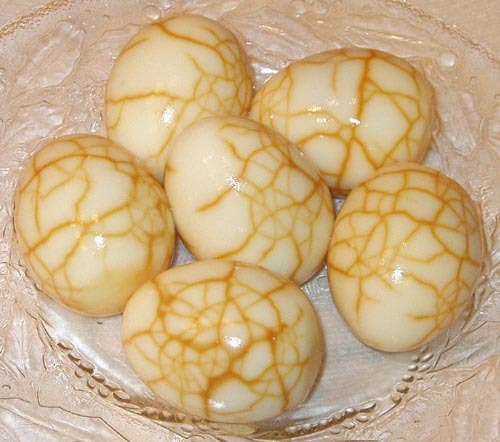 Remove the eggs from the liquid. 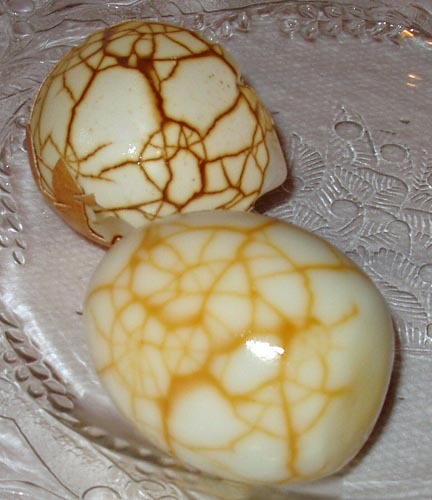 Peel one egg to check how dark it is; the others can be returned to the liquid if you wish to have the web-like pattern darker. Allow the eggs to cool fully. 8. To serve, peel and slice the eggs in halves or quarters. Sprinkle with toasted sesame seeds. I mostly followed instructions, simmering for only another 15 minutes and steeping – cooling down – for 4 hours. 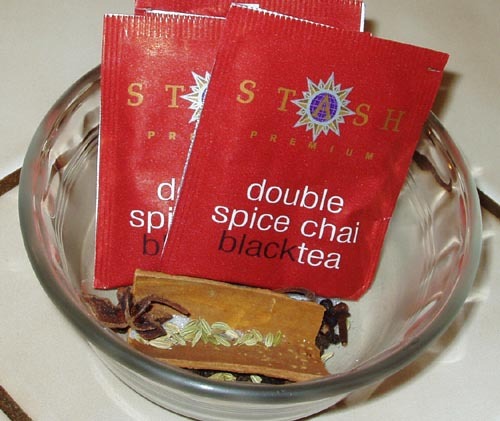 I used whole spices instead of Chinese 5 spice blend (cinnamon bark, fennel seeds, star anise, cloves, pepper) and Chai Spice Black Tea because that’s what I had. I served my eggs deviled with heaping amounts of chipotle. Wash your squash well. Cut in half lengthwise (from stem to stern). Scoop out the seeds and the darkest orange stringy bits, discard or save for toasting. Lay squash halves face down on a lightly greased baking sheet. Bake stems pointed to the back of the oven for 45-60 minutes or until a fork pressed into the flesh near the stem slides in easily. Let cool 15 minutes on baking sheet before attempting to scoop flesh. Place 1/4 cup butter and brown sugar in a large mixing bowl. CAUTION! HOT!! : Scoop the flesh from the squash onto the butter (to melt it). If you can help it, try not to touch the squash with your hands (ouch). Sprinkle salt on top and beat entire mix with a potato smasher or fork until smooth. This is where I might add more butter, if it’s not smoothing out like mashed potatoes. In a medium saucepan on high heat, combine all ingredients and bring to a boil. Continue to boil 20-30 minutes (seeds will start to turn color), or until most of the moisture has evaporated or been absorbed. Remove from heat. Set a rack on the second ring from the top (top 1/3 of the oven is fine). Preheat oven to 400F. Spread pumpkin seeds & whatever water’s left on a lightly greased cookie sheet. Bake 10-30 minutes, gently flipping or shifting the seeds every 5-10 minutes, until all the moisture seems gone. Keep an eye on them, though, because they will burn if not attended. 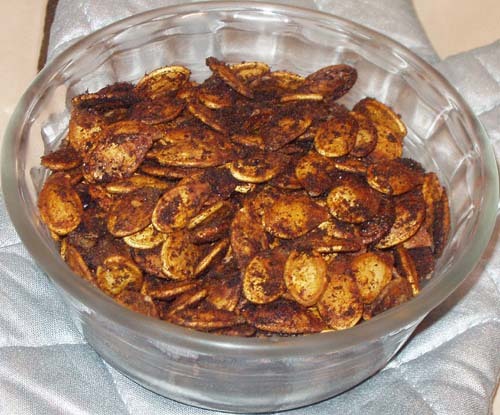 I found these to be superior to the chili pumpkin seeds I normally make. In a medium saucepan on high heat, combine all ingredients and bring to a boil. Continue to boil 10-15 minutes (seeds will start to turn color). Remove from heat. 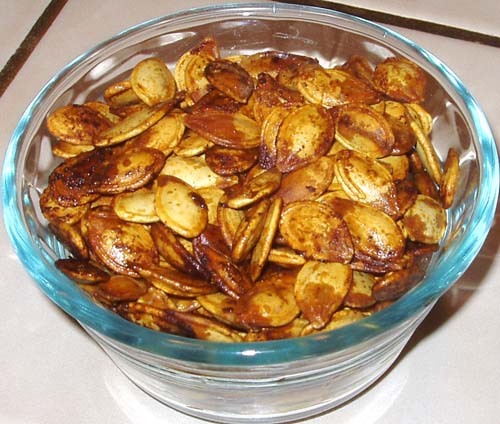 Drain and spread pumpkin seeds on a lightly greased cookie sheet. Bake 10-30 minutes, gently flipping or shifting the seeds every 5-10 minutes, until all the moisture seems gone. Keep an eye on them, though, because they will burn if not attended. Note to self: Use the hot chili powder next time. Steph from Stephfood was our Daring Cooks’ July hostess. Steph challenged us to make homemade noodles without the help of a motorized pasta machine. 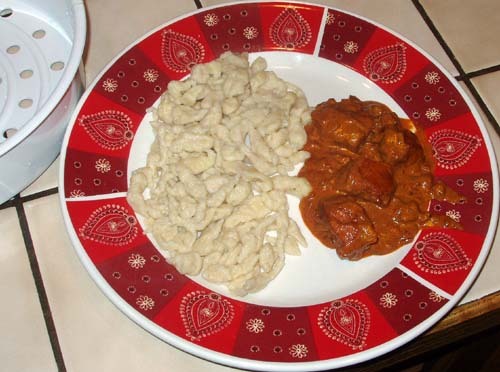 She provided us with recipes for Spätzle and Fresh Egg Pasta as well as a few delicious sauces to pair our noodles with! 1. In a large bowl, whisk together eggs, milk and any herbs and spices that you want to incorporate into the spätzle. 2. Incorporate the flour in small batches, by sifting in a small amount at a time and mixing until the flour is completely integrated. 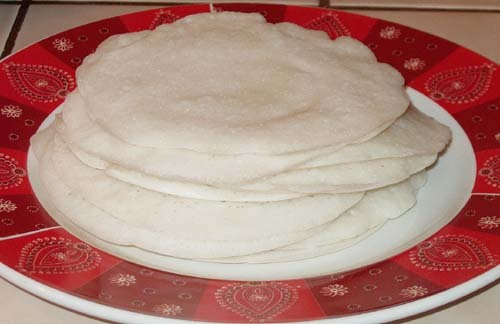 Keep adding flour until the dough becomes elastic, smooth and very hard to stir. Boil a large pot of water. Dip a table spoon into the boiling water to wet it. To form the spätzle, fill the tablespoon about half way with dough, and release into the boiling water. 4. Boil for 15 to 20 minutes. 5. Drain the water from the spätzle. Because it’s full of fun craters where water can hide, you will need to drain it especially well. Toss with the chopped parsley. Seen here paired with chicken paprikash. I pushed my dough through these holes I found in what I think is a food processor salad bowl (I really have no idea, I just found this thing in my “miscellaneous drawer” in the kitchen). I got a little warm standing above the boiling water, but it was worth it. 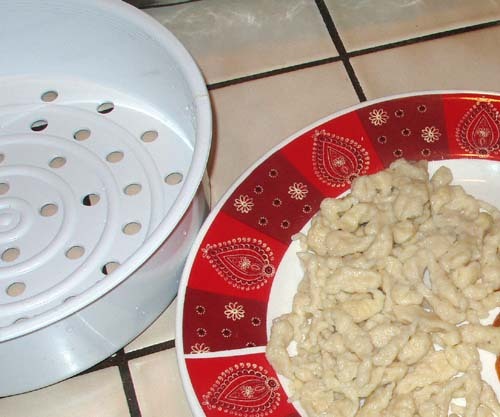 Because the pieces were so much smaller and more spätzle-y, I only had to cook them 8-10 minutes, but I had to do two batches. This was so fast and easy, and it made a light and tasty noodle. My edges weren't thin all the time, but it still worked out. 2. Dissolve the sugar in the coconut water or plain water and add the yeast. Set aside in a warm area for 10-15 minutes, until very frothy. 3. Drain the rice and grind it in a blender with the yeast mixture to make a smooth batter. You can add a bit of extra water if needed, but I did not. Add the cooked rice, and grind/blend to combine well. 4. Pour into a large bowl, cover and leave in a warm place for 8-12 hours. You not only want the mixture to rise and collapse, but to ferment. When it is ready, it will have a slightly sour and distinctly yeasty smell. Don’t worry–they are mild tasting when cooked! 5. Add the coconut milk and salt, and a bit of water if necessary, so that you have a batter that is just a bit thicker than milk. Notice how it bubbles after you add the coconut milk. I recommend test-cooking one before thinning the batter. 6. Heat your pan over medium heat. Wipe a few drops of oil over it using a paper towel. Stir the batter and pour in 3-4 tablespoons, depending on the size of the pan. 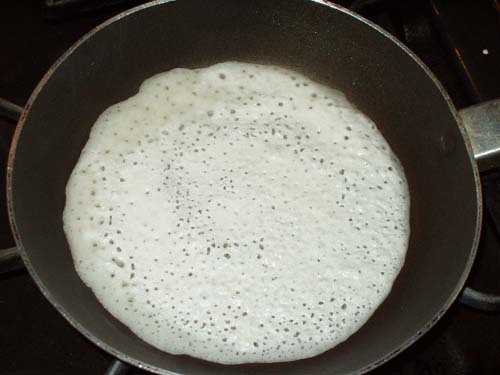 Working quickly, hold the handle(s) and give the pan a quick swirl so that the batter comes to the top edge. Swirl once only, as you want the edges to be thin and lacy. 7. Cover the pan and cook for about 2 minutes. Uncover and check. The center should have puffed up a bit, and will be shiny, but dry to the touch. When ready, loosen the edges with a small spatula and serve immediately. These need to be served hot out of the pan. The leftover batter can be refrigerated for a day or 2. Wow. These are new and amazing to me, and I will be making them again and again. I enjoyed them so much, I was looking around for more.